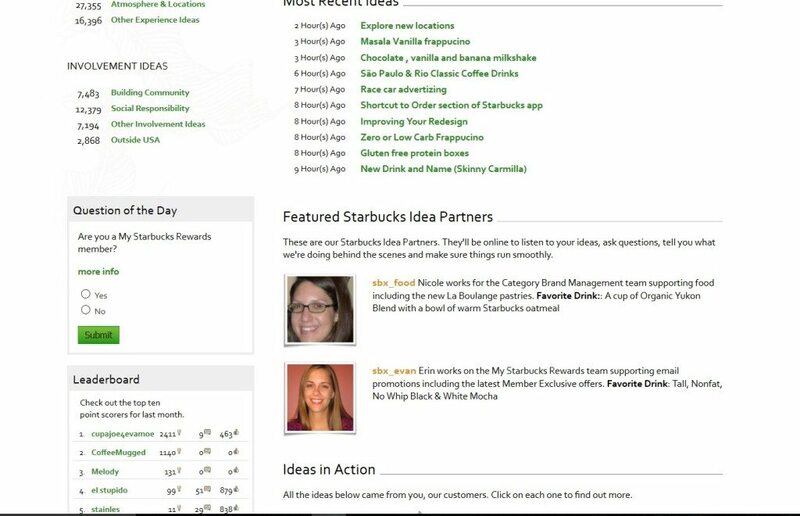 As of today, Starbucks has eliminated the community aspect of MyStarbucksIdea.com. 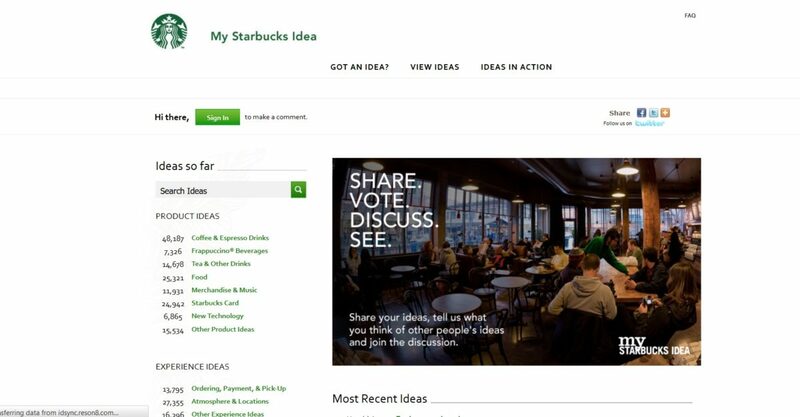 MyStarbucksIdea.com: Create an idea storm style idea submission website where anyone can submit an idea to Starbucks: This was MyStarbucksIdea.com. Clover: Starbucks announced the acquisition of the Coffee Equipment Company, the company which invented the Clover coffee brewer. Starbucks Rewards: Starbucks announced the generation of Starbucks rewards, which included free syrups and milk changes (the MyStarbucksRewards program has changed many times since 2008). Pike Place Roast: Starbucks announced the start of an “Every Day Brew” to begin in stores everywhere in April. That coffee is Pike Place Roast. Conservation International: Starbucks announced a renewed commitment to the non-profit Conservation International. I’ve written about MyStarbucksIdea.com many times: (Click on the links below to find old MyStarbucksIdea.com articles). Commentary: Critical Discussion of MyStarbucksIdea. 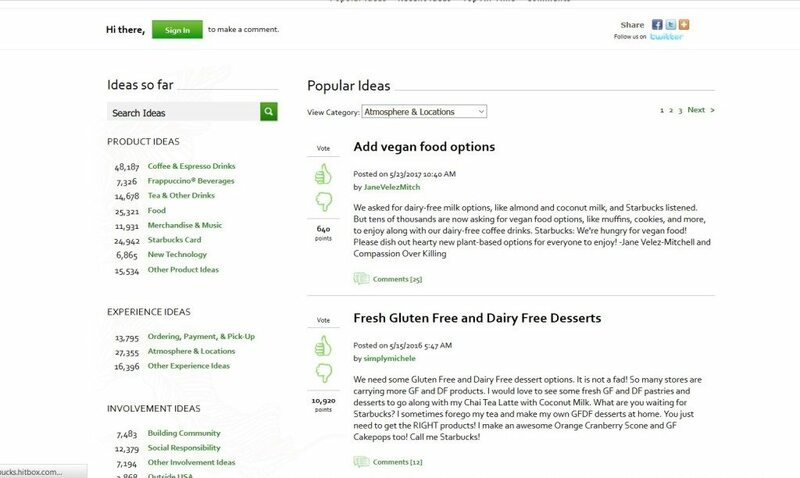 From the beginning of MyStarbucksIdea up until now, MyStarbucksIdea.com had a number of community-friendly features, like the ability to comment on ideas; the ability to vote ideas up and down; and the ability to browse past submitted ideas. All of those features are gone as of today. What do you think of the new MyStarbucksIdea.com? In all honesty, I’m not sure this is all bad. MyStarbucksIdea.com was cute and interactive. But the old version had some problems. It was like a blank slate where anyone could write any idea, whether related to Starbucks or not. There were a lot of duplicative ideas. The voting wasn’t necessarily reliable as to whether an idea would be good for Starbucks or not. In fact, lots of people in the community would have negative comments about ideas that did get implemented. The comments at times weren’t always related to the merits of an idea. In fact, sometimes people got down-voted for reasons that had nothing to do with the merit of their idea -like poor grammar, an angry style, all caps, or other reasons. 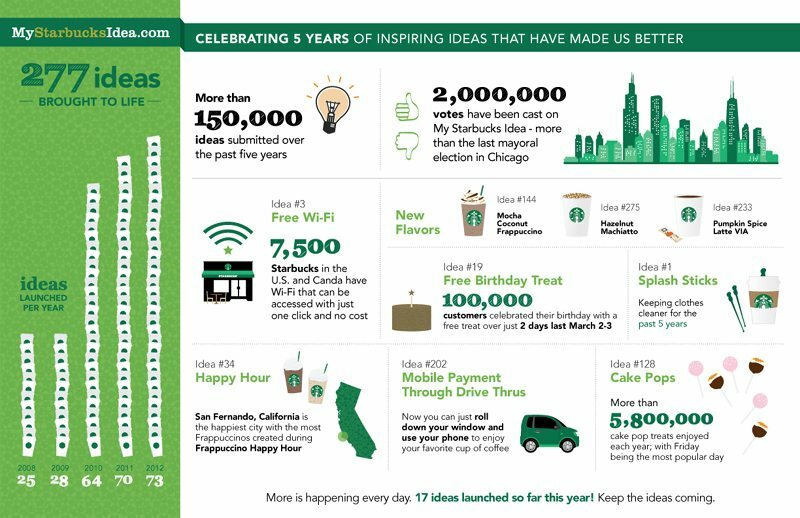 You can present an idea anyway you like – that doesn’t mean it won’t work at Starbucks. So 9 years after it began, the MyStarbucksIdea.com community is gone. You could make a reasonable argument that it just ran its course. There is no such thing as a Starbucks Reserve Store … yet. The Starbucks Verismo – A Review. RIP MSI! I’ll admit it had it’s issues, but I enjoyed interacting with many of the people on there. I mainly frequented it as a source of entertainment-I’d dialogue with people about stuff. Oh well. Wish I could’ve said goodbye to some of my buddies on there before it went away-some of us had been on there since almost the beginning! Good riddance to the old MSI. It was a cesspool of trolls and negative attitudes. 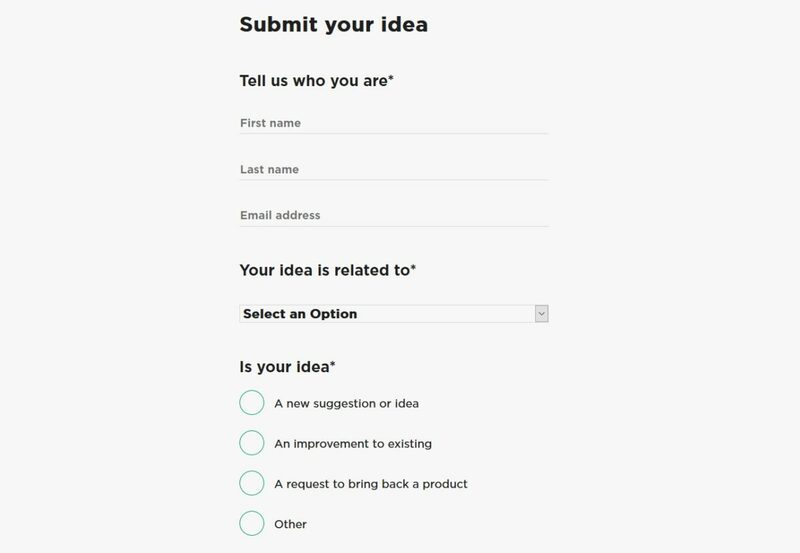 I have an amazing idea for you classic coffee cup ….however the idea submission form won’t send??? I WOULD LIKE TO SEE A LARGER VARIETY OF SUGAR FREE SYRUPS, THERE IS A LARGE PART OF OUR POPULATION THAT IS DIABETIC AND ANOTHER FAIRLY GOOD SIZED PORTION WHO ARE ON LOW CARB (KETO) DIETS, BOTH REQUIRE NO SUGAR. THOSE PPL ARE JUST LIKE EVERYONE ELSE, THEY WOULD LIKE TO HAVE A WIDER VARIETY TO CHOOSE FROM. MORE SUGAR FREE SYRUPS ARE NEEDED.